80% of our immune system is in our gut. There are more nerves in our gut than our brain. Our gut influences our brain, heart & mood. So how does stroke recovery start in the gut? The gut is our "second brain" and influences the way our brain functions to a large extent through neurotransmitter productions. 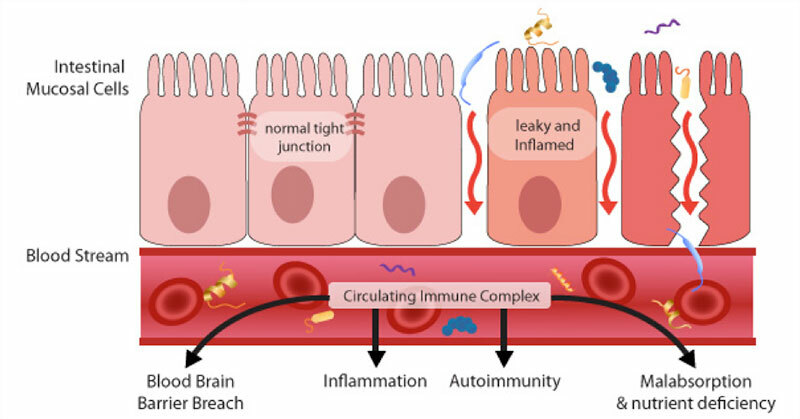 If the tight junctions (barrier in the gut to protect against toxins leaking into the blood stream) aren't functioning properly, the microbiome isn't flourishing and the gut and brain are not functioning optimally. Why is a healthy gut crucial to stroke recovery? Seventy percent of our body's first line of defense – our immune system – is in our gut lining. For this reason, nurturing a healthy gut is crucial during stroke recovery and the rest of your life, because it can help prevent a second stroke. How Can A Healthy Gut Relieve Depression & Heal Your Brain? There are many studies that link an unhealthy microbiome to anxiety and depression. One explanation for this is that your microbiome assists with the production of GABA, a neurotransmitter that's known for improving mood and relieving anxiety. A healthy microbiome also helps reduce cortisol levels – the stress hormone. So a happy gut not only boosts your mood, but it also helps counteract the negative effects of stress. A healthy microbiome is absolutely essential for a healthy mood and a healthy recovery. HEAL YOUR GUT … HEAL YOUR BRAIN! What is RESTORE for Gut Health? RESTORE is a scientifically developed, plant-based mineral that supports the body's own healing power, the immune system and restores gut health. RESTORE heals the tight junctions in the cells in the circulatory system, kidneys, and entire digestive tract. Restore is unlike any supplement on the market. Made in the US, Restore is a soil-derived, scientifically-backed mineral supplement that creates a firewall against toxins entering the gut wall. 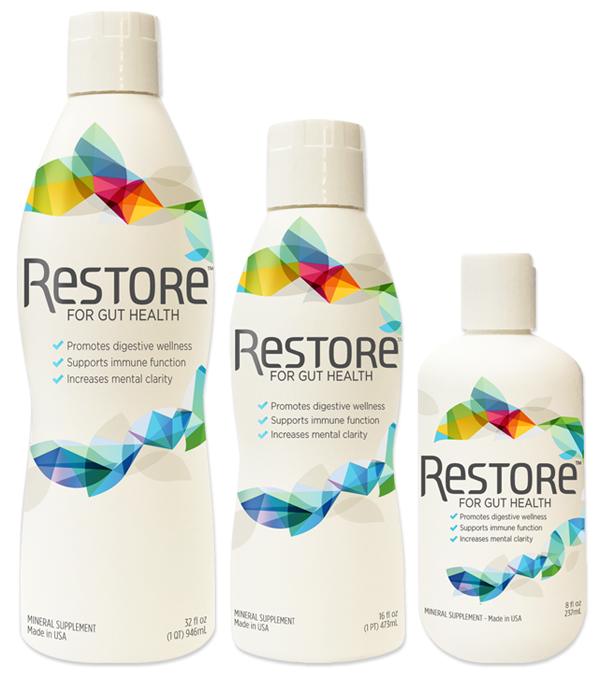 Restore helps create a biological environment for good gut bacteria to grow and flourish, to support improvement of overall health. Created by the Dr. Zach Bush, MD (triple board certified - only a few doctors in the country are triple board certified) and scientists at New Earth Dynamics in Central Virginia. RESTORE made its debut in a clinical medical practice in 2012 at Revolution Health Center in Scottsville, Virginia. MORE ADVANCED THAN PROBIOTIC OR PREBIOTIC SUPPLEMENTS. A typical probiotic is comprised of between three and thirty different bacterial species. Optimally, a healthy immune system contains 20,000-30,000 different strains of good gut bacteria or flora. Restore is unique in that it may enhance the diversity of the gut bacteria by making the gut environment friendlier to the growth of good gut bacteria. RELIEVE STOMACH DISCOMFORT AND MITIGATE ENVIRONMENTAL STRESSORS. Many people feel that their gut just hurts and is upset all the time - gluten sensitivity, allergies, sour stomach. Restore advocates have reported an easing of symptoms almost immediately, sometimes within twenty minutes of taking the first teaspoon. SUPPORT GASTROINTESTINAL MEMBRANES AND THE BLOOD/BRAIN BARRIER. The proprietary formula creates the optimal environment in the gut to allow between 20,000-30,000 different strains of good gut bacteria or gut flora to work together, as Mother Nature intended, to maintain our health. HARNESS THE POWER OF PREHISTORIC LIGNITES. Developed from soil and plant-based mineral deposits and deionized reverse osmosis water, stable carbon organics with a full spectrum of trace soil minerals, mineral salts, platinum group elements, and castor oil. Deionized reverse osmosis water contains virtually no impurities one would find in tap and other bottled water products. DEVELOPED AND TESTED BY DOCTORS. Biomic Sciences LLC has leveraged a team of scientists and PhD's with more than 50 years of research and clinical experience. Our unique dietary supplements and health products address basic health issues affecting a large percentage of global population.